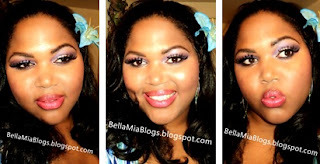 Bella Mia Blogs: Get lost in a Sultry Summer Sunset! Save this look for your next summer evening event! I was so inspired by a ***magical, swirling sunset*** that my fiance and I were lucky enough to witness that I knew I HAD to do this look ^_^ This will forever be one of the best things about makeup, is that there are no limits! If you think you've seen this look before, you're right! 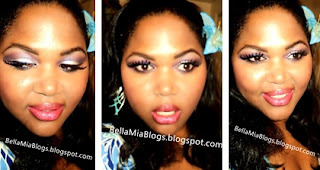 This is the makeup I was wearing in my Blustastic Tips! Two Minute Tutorial. Just in case you missed it, check it out here! This look was soooo much fun to create and I really hope you all will try it out and pretty please (with 10 cherries and a pound of sugar on top ;) ) let me know how you like it! Click to leave me a comment on Facebook! NYX Ultra Pearl Mania Shadow in "White Pearl"
NYX Ultra Pearl Mania Shadow in "True Purple"
CoverGirl Queen Quad in "Violet Vibe"
NYX Long Eye Pencil in "black"
NYX Jumbo Eye Pencil in "Purple"
Coastal Scents Ten Blush Palette "Cotton Candy Pink"
NP Set Cosmetics Highlight Duo in "Peach/Pink"
NYX Jumbo Lip Pencil in "Hera"
NYX Brush on Gloss in "Fusion"
That's a very pretty look. I had watched some of your videos on YouTube previously. Now I can see some of the brands you were using above. I've never used false eyelashes before and had trouble matching my foundation to my changing skin tones. I really the blush tips in the video you embedded in this post. I had only used it as an afterthought for highlighting in the past. Now I know that I should have given the blush more attention.